First, thank you for the prayers and thoughts for my dad! All the tests came out perfectly fine yesterday. He has a follow up appointment today but everything is looking good. I really appreciate you all! As a final project, I critiqued my boxed reading series to check for cultural authenticity. It did okay, which is kind of a relief. I also had to pick out a lesson that wasn't incredibly multicultural and make it better by supplementing it! In the first grade curriculum, there is a story in the kids' Reader called The Foolish Giant. In the story, two boys and one girl are pretending to be a giant, a knight, and a princess. In the story, the princess gets stuck in a tower and is totally dependent on the two boy characters to help her get out. Multiculturalism absolutely includes gender, so I chose to compile a small collection of fractured fairy tales that feature strong female protagonists. Each of the stories either feature a strong female character or offer a different perspective on the typical fairy tale formula. Here are the books I included! Do you know of other fairy tales with strong female characters? I'm always looking to add to my collection! So glad to hear about your dad!! 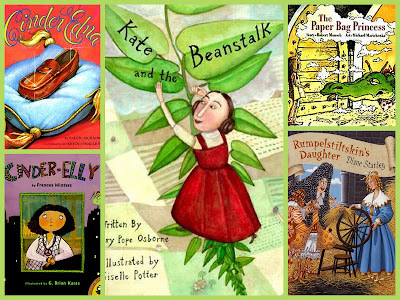 I think the Paper Bag Princess is the all-time Girl Power winner! Whenever I read it to my firsties, I would get to that last page when she tells Ronald that "you are a bum", the boys just all blink like they don't quite know what happened while the girls all squeal with delight. So glad to hear your dad had good news! Ye-Shen and Mulan come to mind. Hope your dad is on the road to recovery. Glad to hear your dad's tests went well. Love this list!I'm planning folktale unit and this will complete it. Thanks for sharing.